–5:20 p.m. on Saturday in the 400 block of North Avenue 64. 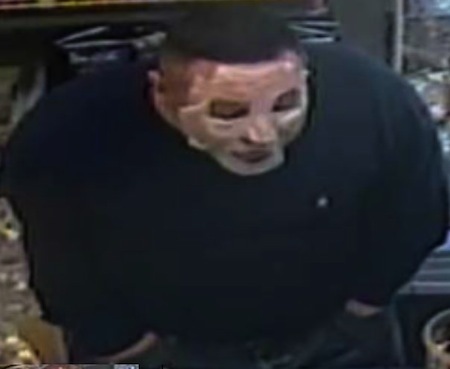 The suspect is described as Hispanic, in his late 20s or early 30s, 5 feet 5 inches tall and weighing about 200 pounds. In each case he was wearing a white paper mask of a type used for cosmetic facials, a black hoodie, blue jeans, gloves and white tennis shoes, possibly Nike Air Max, with blue laces. He was armed with a small blue steel revolver that resembled a starter’s pistol. The mask is form fitting and has holes for the eyes, mouth and nose. Anyone with information that could help investigators identify the suspect was urged to call (323) 561-3472 to speak with Detective Franco. After-hours and weekend calls should be directed to (877) LAPD-24-7. Anonymous tips can be provided through crime stoppers by calling (800) 222-TIPS.